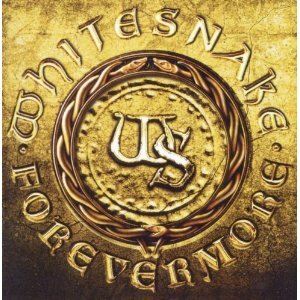 Hall of the Mountain King: Review: Whitesnake, "Forevermore"
Maybe it’s because I was forced to listen to “Is This Love?” way too many times in the late 1980s, but for some reason, I just don’t hold Whitesnake in the same regard as many of my friends of a similar age. When I converted my music collection to CD in the 1990s, I repurchased every single record from many of my favorites of the same era. For Whitesnake, though, I opted for a compilation CD so I can get my fix of “Still of the Night” every now and then. That said, the latest incarnation of the band has released a couple of very interesting records, including their 11th release Forevermore, which debuted in the Top 50 across multiple countries this month. The first thing that you’ll notice about Forevermore is that it has a slightly harder edge than the band’s commercially successful fare of the late 1980s. The overbearing keyboards that became a huge part of the sound with their 1987 eponymous smash are pushed to the back and the guitars of Doug Aldrich (Dio) and Reb Beach (Winger, Alice Cooper) take center stage. That’s evident from album opener “Steal Your Heart Away” with its energetic, Led Zeppelin-style blues rock riff and a huge chorus. But the point is really driven home with the second track, my personal favorite, “All Out of Luck.” The tune opens with an in-your-face monster grooving guitar riff that’s undeniable. The only problem I can find with the song is that riff isn’t featured nearly enough in it. As always, though, most of the songs here are recognizably Whitesnake. The first taste of the classic Whitesnake big rock sound comes on third track and opening single “Love Will Set You Free.” It’s a hard-driving number, again with some solid guitar, but it owes much more to the 1987 record than the first two songs. It’s got that same polished and maybe a-little-too-perfect sound. The trend continues with ballad “Easier Said Than Done” and another rocker “Tell Me How.” That series of songs will surely satisfy fans of the band’s big hits, but leaves me wanting a little more of the heaviness in those first two songs. Coverdale always has to work out his Zeppelin fetish, and he does that in impressive style on Forevermore with “Whipping Boy Blues.” In the early acoustic stages of the song, it will remind listeners quite a bit of the Zep classic “Gallows Pole,” but things quickly get heavier thanks again to Aldrich and Beach laying down some hot licks. In the end, the song is easily one of the best on the record and, for me, ranks as one of the best in the band’s history. As the one constant in the band since it began in 1976, Coverdale’s distinctive vocals are the centerpiece of the sound. They’re spot on here, if a bit dry at times, but that’s always been the case. A few of the songs on Forevermore do find him stretching out a little, and on a couple, like album opener “Steal Your Heart Away,” it might even be a little tough to peg it as Coverdale on a blind listen. That’s a good thing, though. Forevermore strikes a good balance between music that fans of the band’s big hits can enjoy and a harder edged style that will appeal to those who thought those hits were just a little too polished. There are a few rough edges left on some of these songs, reaching back to their pre-1987 sound. Being, at best, a casual fan of Whitesnake, I didn’t expect to like this record, but I’ve kept returning to it in the couple of weeks since I got my hands on it. It’s an impressive outing and worth checking out for hard rock fans, even if they’re not big fans of the band’s previous work. I won’t tell you that Forevermore will have me digging out my old Saints and Sinners and Slide It In cassettes, but a “Still of the Night” fix would go pretty well with this record.